SoftPlanet makes it possible for everyone to get free RJ TextEd download directly from our servers. There is no registration needed for downloading. 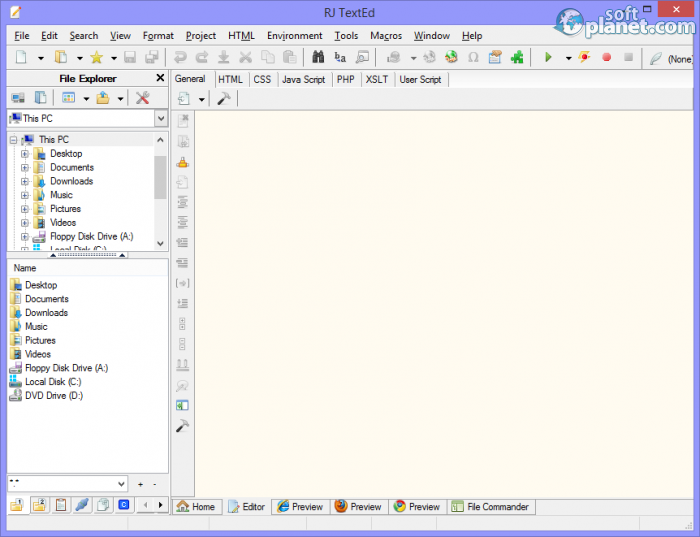 RJ TextEd 8.70 is a free-to-download application which is a rich plain text editor and can be used to edit source code too. 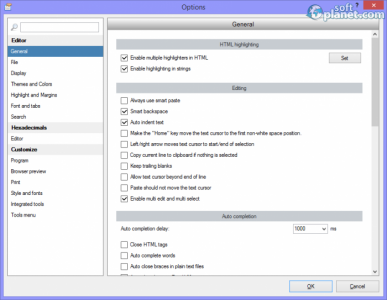 By looking at it from a different perspective it is capable of editing web development languages and is packed with a syntax highlighting feature. Users can also handle and detect Unicode with it as well as ASCII and binary files. C++, C#, CSS, HTML, Java, Pascal, Perl, PHP, XML, etc. are only a few of the supported programming languages. The list of all RJ TextEd features is very long and we already mentioned some of them. 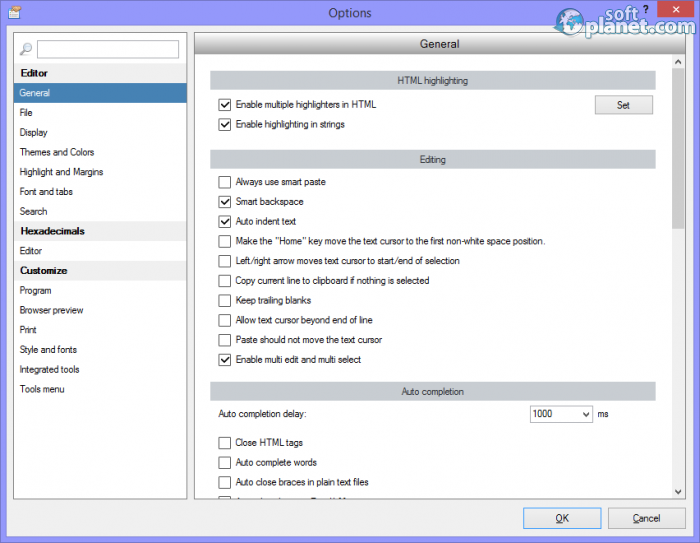 The CSS and HTML wizards and preview capabilities are not to be missed, thanks to the internal Internet Explorer, Mozilla Firefox and Google Chrome web browsers. This app is a multi-language program and can be used on Windows 2000, XP, Vista, 7 and 8 operating systems. The user interface of RJ TextEd is very promising and you can tell that just by looking at the program. There are five bars which the application can display simultaneously and any one of them can be hidden too. The Sidebar is located to the left and has 7 pages. 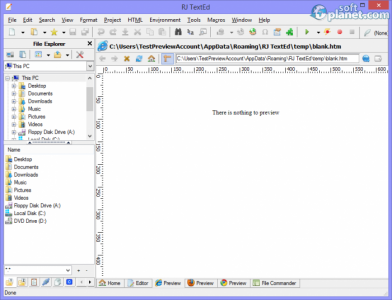 The Main toolbar is placed right underneath the program menus. The Quickbar sits on top of the main view window while five tabs are located at the bottom: Home, Editor, IE preview, Firefox preview, Chrome preview and File Commander. Using the preview tabs RJ TextEd can visualize your projects and therefore you do not need to reach for an external browser. The File Commander tab is actually a built-in file explorer which can be used to manage anything related to files and folders on the local machine or on an FTP/SFTP server. It also can operate with ZIP archived files which is very handy for most of the time. Our security scan shows that RJ TextEd is clean from viruses. The current version of RJ TextEd has been scanned by our system, which contains 46 different anti-virus algorithms. That ensures that RJ TextEd 8.70 is 100% safe for your computer.